In this scenario, a trader who is mapped to TTORD-type credentials needs to stage orders to an Execution Desk. All traders at the Execution Desk are mapped to exchange trader credentials and share an order book. Therefore, the TTORD credentials of the trader who originates the staged order must be mapped to the exchange trader credentials of one of the execution traders. For example, assume two portfolio managers at different buy-side firms need to stage orders for CME contracts to an execution desk at a sell-side firm. These portfolio managers do not share an order book. For this example, assume a portfolio manager and the execution traders who will work the staged orders use the credentials shown in the following table. To illustrate how order routing credentials affect staged orders, follow a staged order as it progresses through its workflow with the users listed in the previous table. Portfolio Manger PM1 submits a BROKER staged order for a CME contract. The TT system routes the staged order to the TT SSE-A Gateway. ET2, because he shares an order book with ET1 for both SSE-A and CME-A. SSE-A does not send an order acknowledgement to PM2 because PM1 and PM2 do not share an order book. Either ET1 or ET2 can claim and begin working the staged order after it appears in their X_TRADER Orders and Fills Window. After one of them claims the staged order, no one else may work it. 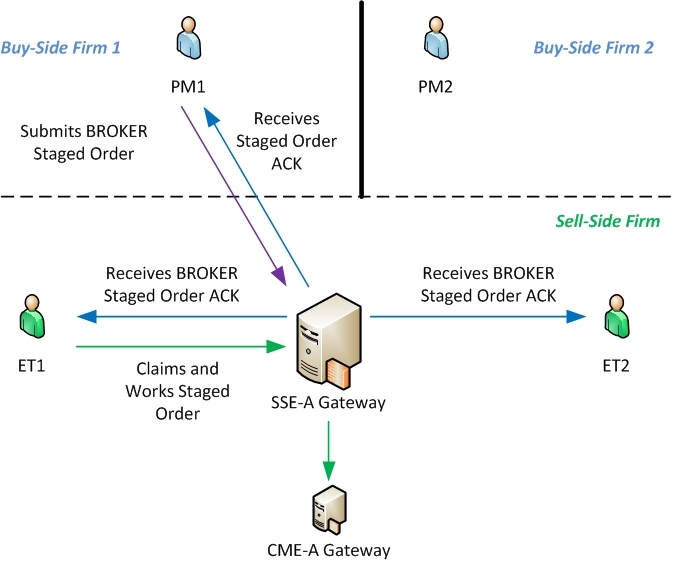 For each child order the execution trader (ET1 or ET2) submits, the TT CME-A Gateway sends an order acknowledgments to both execution traders (ET1 and ET2) and to the portfolio manager who created the order (PM1). The TT CME-A Gateway sends a child order fill to all of the execution traders (ET1 and ET2) and to the portfolio manager who created the order (PM1). Standard order visibility rules apply to child orders of staged order. The Synthetic SE Server sends a partial fill for the parent staged order associated with the child order to PM1, ET1, and ET2. Portfolio Manger PM1 calls Execution Trader ET1 and asks the trader to enter a staged order for a CME contract on his behalf. Trader ET1 submits a BROKER staged order with the PM1’s account number. The TT system routes the staged order to the TT SSE-A Gateway. Either trader ET1 or ET2 can claim and begin working the staged order after it appears in their X_TRADER Order and Fills Window. After one of them claims the staged order, no one else may work it. The TT CME-A Gateway sends a child order fill to all of the execution traders (ET1 and ET2) and to the portfolio manager who created the order (PM1).